Bionand, recently incorporated to NANBIOSIS ICTS, among the three national biotechnology reference centers. You are here : Home / ICTS / Bionand, recently incorporated to NANBIOSIS ICTS, among the three national biotechnology reference centers. 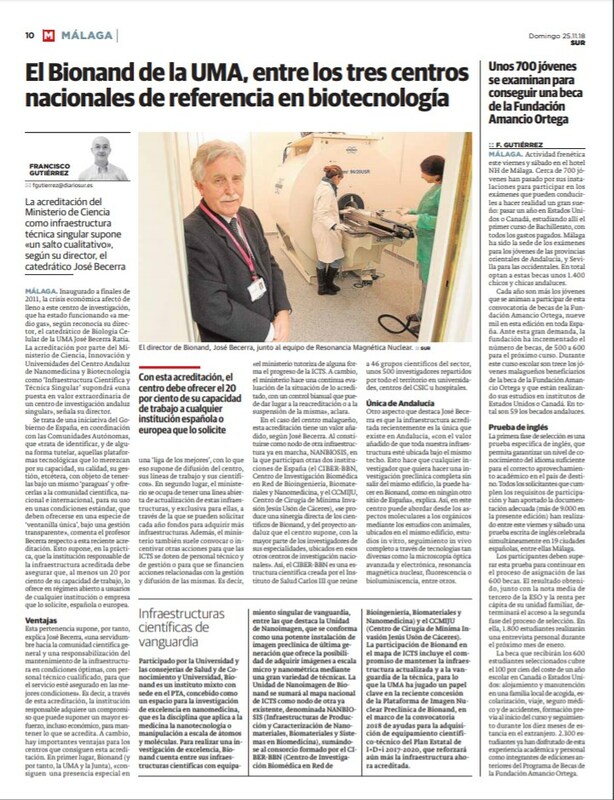 The Diario Sur of Andalucía, publishes today an article dedicated to BIONAND and its recent accreditation as ICTS by the Ministry of Science, Innovation and Universities, that resolved on November 6 the incorporation of the Nanoimaging Unit of BIONAND to the ICTS NANBIOSIS. In the article, the Director of BIONAND, Jose Becerra Ratia, Professor of Cell Biology of the University of Malaga, explains the opportunities and commitments that imply for the Andalusian Center for Nanomedicine and Biotechnology (BIONAND) its incorporation to NANBIOSIS.